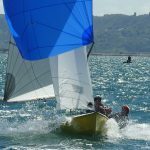 Adam and Richard Bowers have been sailing Scorpions since their teens (a long time ago and not to mention age specifically but the world was in black and white back then) and hence have a huge amount of knowledge when it comes to Scorpion sails and rigs. Working with 9 times National Champion, John Mursell, has given us a great starting point for our new designs. 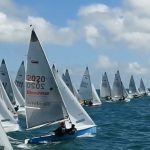 Fast “out of the box” the sails proved themselves at the 2017 national championships. Read John’s comments here. 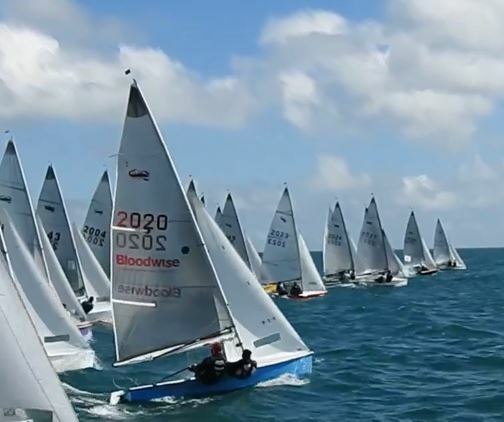 The mainsail design has been revisited to take advantage of the light weight and high strength of Dimension Poylant ODL 4.0. This cross cut design gives excellent shape stability whilst being flexible enough to cope with the full range of wind conditions. 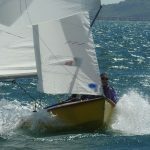 Designed with a relatively full entry this sail has a wide groove to steer in giving the helm lots of options to point or foot. The elipticity of this design allows for a great trimming experience. On a tight reach the luff can be rolled without instantly collapsing. On broader reaches and down wind the shoulders project to give maximum projected area. You know that feeling when the spinnaker on the boat behind seems to be projecting better and looks faster? Well if it’s a Moatt Spinnaker you’re looking at , perhaps it is!